Justin Rose finishes on the 18th in the second round of the BMW Championship golf tournament at the Aronimink Golf Club in Newtown Square. Xander Schauffele lines up on the 18th in the second round of the BMW Championship. 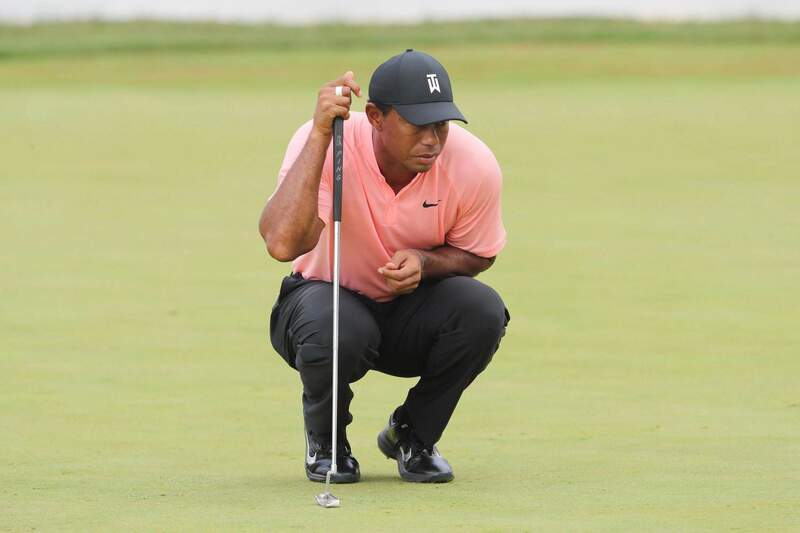 Tiger Woods Lines up his putt on the 18th in the second round of the BMW Championship. 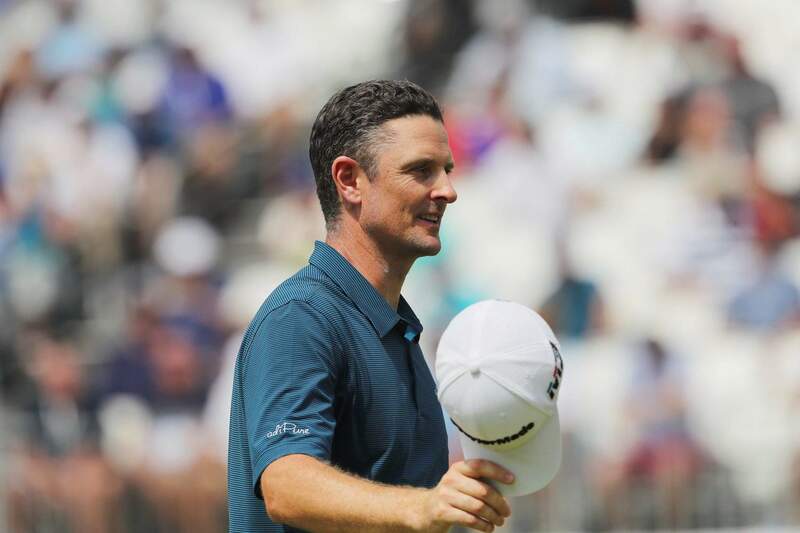 NEWTOWN SQUARE, Pa. – Justin Rose did his part on another day of low scoring Saturday in the BMW Championship, running off four straight birdies early for a 6-under 64 and a one-shot lead over Rory McIlroy and Xander Schauffele. Still ahead is a final round at soggy Aronimink Golf Club that could take more than one day to complete because of rain in the forecast, along with a 13 player within five shots of the lead. The list includes Tiger Woods, who shot 66 and made up no ground on the lead. “If you shoot 65, you were losing ground,” McIlroy said with only slight exaggeration. Rose made four straight birdies early on the front nine to quickly erase a two-shot deficit to Schauffele, and he finished the front nine birdie-birdie for a 29. 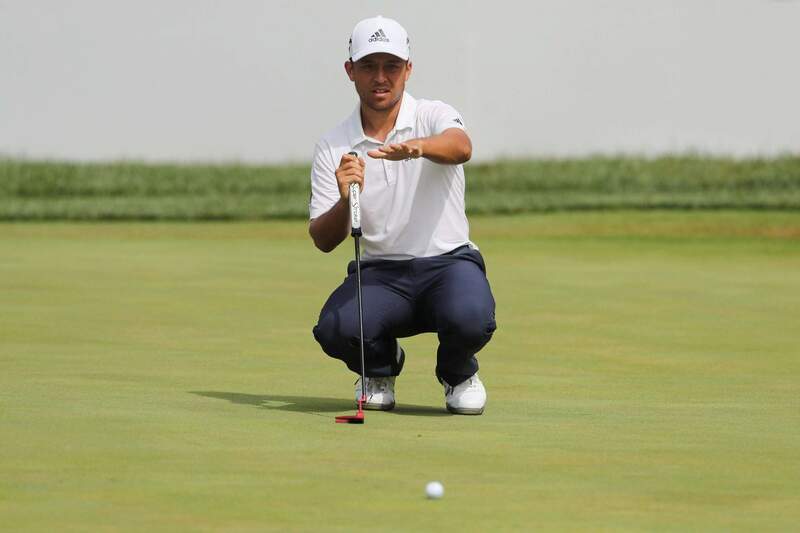 Schauffele, hopeful that a victory will give U.S. captain Jim Furyk reason to pick him for the Ryder Cup, stayed with Rose the whole way until he three-putted from the tight collar on the 18th hole for a bogey and a 67. McIlroy picked himself up quickly from a double bogey on the par-3 eighth hole with a 3-wood onto a green so soft on the par-5 ninth that it barely bounced forward and caught a slope down toward the pin, leaving him a short eagle putt. Three birdies over the last six holes gave him a 63 and a spot in the final group. The top 30 in the FedEx Cup after the final round advance to East Lake in Atlanta for the Tour Championship. Bryson DeChambeau already has clinched the No. 1 seed with victories in the opening two playoff events. The more interesting race is at the bottom. Jordan Spieth salvaged his round late again for a 66, but he still was just outside the top 30. He has never missed the Tour Championship, and he likely would face some form of penalty from not having added a new tournament to his schedule without competing in at least 25 events. He needs to be at East Lake to reach 25. Keegan Bradley made two tough pars for a 66 and narrowly edged past Spieth for the 30th spot. For someone like Bradley, getting to the Tour Championship would get him into all four majors next year. Scoring was the lowest it has been all week at 67.17. Only six players from the 69-man field were over par, and there was a 62 for the third straight round. Tommy Fleetwood has two of them, Friday and Saturday. After opening with a 71, Fleetwood goes into the final round just two shots behind. So does Rickie Fowler, despite a bogey on the final hole for a 65. Fowler played in the final group at Aronimink in 2011 when it held the AT&T National, though he faded to a tie for 13th. He is trying to win for the first this year. For Woods, it was another lost opportunity, even though he remains in the mix. He opened with two straight birdies and the crowd was on his side, loud as ever. He followed with 11 straight pars, even though he had chances from 15 feet and closer. How low is the scoring? It was the 17th time Woods had a 54-hole score of 198 or lower. The previous 16 times he was either leading or tied for second. At Aronimink, he was tied for 11th. A victory should be enough for Rose to reach No. 1 in the world, especially with Dustin Johnson and Brooks Koepka nine shots out of the lead. Much depends on Justin Thomas, who was only four shots behind. The question is whether — or when — the fourth round would end. Tee times were pushed back three hours on Saturday because of overnight rain that kept falling into the morning. Starting times have been moved up to 7 a.m. Monday with hopes of having enough time to weather any storm. The PGA Tour is off next week. The only activity of any relevance is Furyk making his final selection, which at this stage would appear to be down to Tony Finau or Schauffele. Finau shot a 67 and was tied for 15th, six shots behind.